The Against Malaria Foundation (AMF) is a United Kingdom-based charity that provides long-lasting insecticidal nets (LLINs) to populations at high risk of malaria, primarily in Africa. As of July 2016, the foundation has raised $86.6 million and distributed or committed to fund 19.3 million LLINs since its founding in 2004. AMF estimates that, as of July 2016, the average cost of an LLIN is $2.50 (which does not include distribution costs; GiveWell's estimates include this cost). AMF has eight trustees and an advisory committee drawn from leading malaria experts around the world. The charity is registered in the United Kingdom and governed by the laws of England and Wales. It is also registered in the USA, Germany, Canada, Japan, and other countries. GiveWell, an independent charity evaluator, named AMF its top-rated charity worldwide in 2011 and 2012, but removed it from its list of charities in November 2013 due to room for more funding-related issues. It was once again recommended by GiveWell in 2014. In 2015, GiveWell again listed AMF as a top charity, recommended a $22.8 million grant from Good Ventures to AMF, and identified an additional funding gap of $75.4 million for the organization, of which $27.5 million would be needed for the organization's planned activities for the coming year. They identified AMF's funding gap as the most critical of the funding gaps of all their top charities, and their recommended allocation to donors was to give all their donation to AMF. The status was reaffirmed in the mid-2016 and November 2016 top charities refresh, with updates to the estimated funding gap. 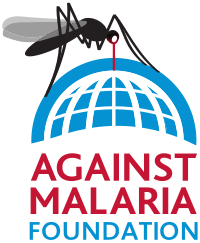 The Against Malaria Foundation was set up in August 2004 with the purpose of handling money raised through the World Swim Against Malaria, a global fundraising event scheduled for December 3, 2005. More than 250,000 people participated in the swim, which raised $1.3 million to buy mosquito nets. The money was used to buy 270,000 nets, which were distributed to protect an estimated 540,000 people from the risk of mosquito-borne malaria infection. The World Swim Against Malaria was the brainchild of Rob Mather, a London-based strategy consultant. Mather had earlier organized a swim to raise money for a 2-year-old girl who was badly burned in a house fire. Held in December 2003, the "Swim for Terri" started as a three-person fundraiser and grew to include 10,000 swimmers in 73 countries. In 2012, AMF did not undertake all planned distributions due to safety concerns in Mali and concerns about transparency with potential partners in Malawi and Togo. In May 2016, AMF began accepting Bitcoins for donations. One hundred percent of funds raised through AMF's website are used to purchase bednets, according to the foundation's founders. Distribution and education costs are covered by distribution partners. Administrative costs are covered by the charity's trustees and a small group of private donors. The foundation also benefits from in-kind contributions of services from lawyers, accountants, advertising agencies, professional translators, web technologists, and others. In 2010, AMF took in £1.3 million and spent £1.6 million, with £1.4 million going directly to charitable activities. A distribution partner submits to AMF a proposal to distribute mosquito nets in a targeted high-risk area. AMF's Malaria Advisory Group reviews the proposal, with requests for further information if necessary. The Group approves, amends, or rejects the proposal based on available funding and the needs of the target area. AMF and the distribution partner sign a contract laying out each party's obligations. AMF raises the funds for the nets and purchases them directly from the manufacturer, while the distribution partner covers all non-net costs. The nets constitute the majority of the distribution's costs. In some cases, the partner will raise funds through AMF's website, in which case all funds raised are ring-fenced for the partner's proposed distribution. All details of each distribution are made available to the public on dedicated "distribution pages". After sufficient funds have been raised, the distribution partner arranges the distribution logistics with the targeted community and pays for the nets to be shipped and stored nearby. The distribution partner distributes the nets in the targeted community, and offers education on proper usage of the nets as well as general malaria education. As per the agreement with AMF, the partner documents the distribution via reports, photo, and video. The distribution partner files a post-distribution report with AMF. The partner carries out post-distribution surveys 6, 18, 30, and 42 months after the distribution to monitor net usage and conditions. The partner collects malaria case rate data on a quarterly basis, and emails the information to AMF. AMF is supported by more than 100 corporations. AMF's principal partners are PwC, Citigroup, Speedo, Microsoft, Allen & Overy, Attenda, Vestergaard Frandsen, and Sumitomo Chemical. Speedo also partnered with AMF's precursor organization, World Swim Against Malaria, and continues to raise money for bednets through swimming events. AMF's principal distribution partners are Population Services International, the Malaria Consortium, Partners In Health, the Red Cross, World Vision, and Concern Universal. Sixty organizations fundraise for bednets using AMF's website or their own. Charity evaluator GiveWell listed AMF as its top-rated charity in 2011 and 2012, removed it from the top-rated charity list in November 2013, and reinstated it as a top-rated charity in 2014. GiveWell's reviews and recommendations of AMF have been cited in The New York Times and The Chronicle of Philanthropy. Details of GiveWell's reviews are below. GiveWell's estimate of the cost-per-life-saved for AMF has varied over the years. The estimates are summarized below. In November 2016, GiveWell updated its review of AMF and published an updated list of its top charities, along with grant recommendations made to Good Ventures for these top charities. AMF was in the list of top charities. In June 2016, GiveWell published an updated review of AMF and published an update to its top charity list based on that. AMF was in the list of top charities, and GiveWell recommended to donors to allocate all their money to AMF, whose funding gap GiveWell considered most pressing. Using its room for more funding philosophy, GiveWell identified the following funding gaps for AMF (note that totals may not exactly match due to rounding). In November 2015, GiveWell updated its review of AMF and published an updated list of its top charities, along with grant recommendations made to Good Ventures for these top charities. AMF was in the top charity list, and GiveWell recommended a $22.8 million grant to the organization. Moreover, GiveWell recommended that individual donors who wished to follow its recommended allocation donate all their marginal funds to AMF, since it had the largest clear funding gap after accounting for the grants being made by Good Ventures. Execution Level 1 (the amount over and above the capacity-relevant amount that the charity would need to execute projects in the coming year) $43.8 million $16.3 million (37%) $50.3 million $22.8 million (45.3%) $27.5 million (GiveWell considers this funding gap the most important of all its top charity funding gaps this year, and does not expect the full funding gap to be closed. Hence it recommends all donations be directed to AMF). In November 2014, GiveWell published an updated review of AMF. Based on this, in December 2014, GiveWell reinstated Against Malaria Foundation as one of four top charities, citing the fact that AMF had successfully "committed the bulk of its current funds" to distributions of long-lasting insecticidal nets, an expectation that AMF's programmes would continue to be exceptionally cost-effective, and AMF's willingness to transparently communicate its successes and failures. GiveWell also named Deworm the World Initiative, GiveDirectly, and Schistosomiasis Control Initiative as top charities, stating that "reasonable people could reach a very wide variety of conclusions regarding which charity accomplishes the most good per dollar". Based on GiveWell's recommendation, Good Ventures donated $5 million to AMF. Taking into account the Good Ventures donation, GiveWell said that, if they were to control the allocation of marginal donations, they would allocate 67% to AMF. In November 2013, GiveWell removed AMF from its list of top-rated charities due to room for more funding-related issues. GiveWell also updated its review of AMF. Rob Mather of AMF stated that GiveWell did not take into account that AMF had funds left due to concerns of theft in Sierra Leone. In November 2012, GiveWell named AMF as its top-rated charity for the second year in a row, along with GiveDirectly (ranked #2) and Schistosomiasis Control Initiative (ranked #3). GiveWell also published a new lengthy review of AMF. GiveWell published its second review of AMF in November 2011. GiveWell ranked AMF as its top charity in 2011, listing Schistosomiasis Control Initiative as the #2 charity. GiveWell published its first review of AMF in 2010. In the review, GiveWell estimated that, "when ITN distributions are effective, $182–$1126 prevents a death from malaria and prevents 320 less severe malaria episodes." This is a higher level of cost-effectiveness than GiveWell's current estimate, but, at the time, appeared less cost-effective than GiveWell's top-rated charity VillageReach. GiveWell gave AMF a Silver Medal status and ranked it #3 in its list of top charities, behind VillageReach and the Stop TB Partnership. Giving What We Can, a fundraising organization dedicated to ending global poverty, named AMF as the first of its four top rated charities. They also published their own review of AMF. In December 2013, shortly after GiveWell delisted AMF from its list of top charities, Giving What We Can published a blog post stating that they continued to stand by AMF as their top recommendation. The Life You Can Save, a website that advocates the charitable philosophies of Peter Singer, recommends donating to AMF on the grounds that the charity focuses on the world's poorest people and saves a human life for roughly $1,800. ↑ "People". The Against Malaria Foundation. Retrieved July 15, 2016. 1 2 "AMF's Charity Commission profile". Charity Commission. Retrieved 12 August 2011. ↑ "Why US$2.50 per net?". Against Malaria Foundation. Retrieved July 12, 2016. ↑ "A conversation with Rob Mather and Peter Sherratt, September 9, 2015" (PDF). GiveWell. September 9, 2015. Retrieved July 12, 2016. ↑ "Malaria Advisory Group". Against Malaria Foundation. Retrieved July 12, 2016. ↑ "About Us: Charity Status". Against Malaria Foundation. Retrieved 8 July 2011. 1 2 "Top-Ranked Charities". GiveWell. Retrieved 13 December 2012. 1 2 3 "GiveWell December 2014 Updated Top Charities". GiveWell. Retrieved December 6, 2014. 1 2 "Our updated top charities for giving season 2015". November 20, 2015. Retrieved November 20, 2015. 1 2 3 Stone-Crispin, Natalie (June 23, 2016). "Mid-year update to top charity recommendations". GiveWell. Retrieved June 26, 2016. 1 2 Natalie Crispin (November 29, 2016). "Our updated top charities for giving season 2016". The GiveWell Blog. Retrieved November 29, 2016. ↑ "About Us". Against Malaria Foundation. Retrieved 8 July 2011. ↑ "FAQ". World Swim Against Malaria. Retrieved 8 July 2011. ↑ "homepage". Swim for Terri. ↑ "Update to donors with as yet allocated donations". Against Malaria Foundation. ↑ JP Buntinx (May 5, 2016). "Against Malaria Foundation Now Accepts Bitcoin Donations". The Merkle. Retrieved June 17, 2016. ↑ "Our Approach". Against Malaria Foundation. Retrieved 16 August 2011. ↑ "Our Approach". Against Malaria Foundation. Retrieved 8 July 2011. ↑ "Distribution Strategy". Against Malaria Foundation. Retrieved 11 July 2011. ↑ "People to Thank page". Against Malaria Foundation. Retrieved 14 July 2011. ↑ "Speedo World Swim". Against Malaria Foundation. Retrieved 14 July 2011. ↑ "Distribution Partners". Against Malaria Foundation. Retrieved 13 December 2012. ↑ "Sponsors and Donors". Against Malaria Foundation. Retrieved 13 December 2012. 1 2 3 4 Flandez, Raymund (December 13, 2013). "GiveWell Recommends 3 Charities for Year-End Donations". Chronicle of Philanthropy. Retrieved June 11, 2016. 1 2 Ron Lieber (April 25, 2014). "Donating, and Making Sure the Money Is Put to Work". The New York Times. Retrieved June 17, 2016. ↑ Wiblin, Robert (December 24, 2015). "Where should you donate to have the most impact during giving season 2015?". 80,000 Hours. Retrieved June 11, 2016. 1 2 3 "GiveWell cost-effectiveness analysis — November 2016: Bednets sheet". GiveWell. November 2016. Retrieved November 29, 2016. 1 2 "Against Malaria Foundation (AMF)". GiveWell. June 21, 2016. Retrieved June 26, 2016. 1 2 "Against Malaria Foundation". GiveWell. November 1, 2015. Retrieved November 28, 2015. 1 2 "Against Malaria Foundation (AMF) - 2014 review". GiveWell. November 1, 2014. Retrieved November 28, 2015. ↑ Derek Thompson (June 15, 2015). "The Greatest Good". The Atlantic. Retrieved June 11, 2016. ↑ Chris Weller (July 29, 2015). "The world's best charity figured out the cheapest way to save a human life". Retrieved June 17, 2016. 1 2 "Against Malaria Foundation". GiveWell. November 2013. Retrieved December 26, 2013. 1 2 "Against Malaria Foundation". GiveWell. November 2012. Retrieved December 26, 2013. ↑ Felix Salmon (June 10, 2013). "Adventures with quantitative philanthropy". Reuters. Retrieved June 11, 2016. 1 2 "Top charities - November 2011 archived version". GiveWell. November 2011. Retrieved December 26, 2013. ↑ Dylan Matthews (November 29, 2016). "These are the charities where your money will do the most good". Vox. Retrieved November 30, 2016. ↑ Karnofsky, Holden (November 26, 2013). "Change in Against Malaria Foundation recommendation status (room-for-more-funding-related)". GiveWell. Retrieved November 27, 2013. ↑ Linch Zhang (June 21, 2016). "How Can You do the Most Good with Your Charitable Giving? This Expert's Answers Might Surprise You". The Huffington Post. Retrieved June 21, 2016. ↑ "GiveWell decision blog post". GiveWell. Retrieved 13 December 2012. ↑ "Against Malaria Foundation - 2011 review". GiveWell. November 2011. Retrieved December 26, 2013. ↑ Karnofsky, Holden (November 29, 2011). "Top charities for holiday season 2011: Against Malaria Foundation and Schistosomiasis Control Initiative". Retrieved November 26, 2012. ↑ Karnofsky, Holden (December 8, 2011). "Deciding between two outstanding charities". GiveWell. Retrieved November 26, 2012. ↑ Zander Redwood (November 20, 2011). "The best causes – updated". 80,000 Hours. Retrieved June 17, 2016. ↑ "Against Malaria Foundation - 2010 review". GiveWell. 2010. Retrieved December 26, 2013. ↑ "Top-rated charities - 2010 archived version". GiveWell. 2010. Retrieved December 26, 2013. ↑ "Where to Give". Giving What We Can. Retrieved December 26, 2013. ↑ "Further information about AMF". Giving What We Can. Retrieved December 26, 2013. ↑ Mogensen, Andreas (December 12, 2013). "Why we continue to recommend the Against Malaria Foundation". Giving What We Can. Retrieved December 26, 2013. ↑ "Organizations to Give to". Peter Singer. Retrieved 14 July 2011. Against Malaria Foundation GiveWell's assessment of the Against Malaria Foundation. Includes extensive details about the organization's administration, funding, transparency and effectiveness.